1969 Fender Deluxe Reverb Restoration -- a reprise from my old site . 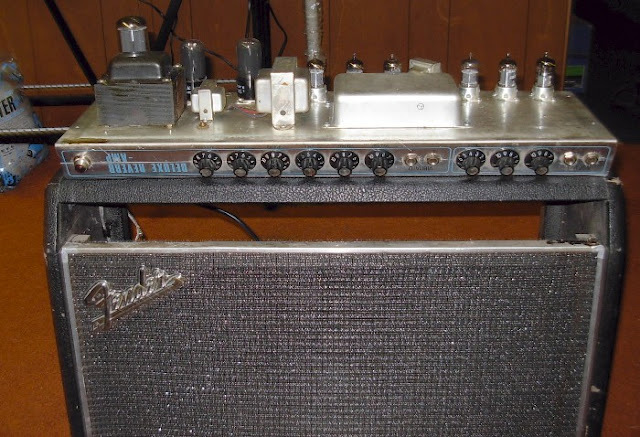 Above — In Fall 2008, I had occasion to work on a friend's 1969 Fender Deluxe Reverb (DR) amplifier. Since I didn't own this amplifier, only necessary repairs and parts replacement were performed. This amp was a post - CBS Fender DR, but apart from a few different components such as the power transformer and rectifier tube, the circuitry and tone proved quite similar to the pre - CBS Deluxe Reverb amps I've worked on. 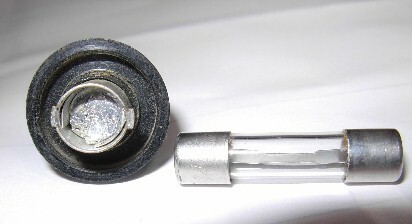 Above — The 14 amp fuse found in the fuse socket. The fuse spring was missing and tin foil was used to make the contact to the fuse holder cap. This scared me! A 14 amp fuse in the fuse socket - plus the fuse spring was missing. A 14 foot (blue) AC power cord had been wired to the power transformer, plus, the grounding prong in the plug was missing. 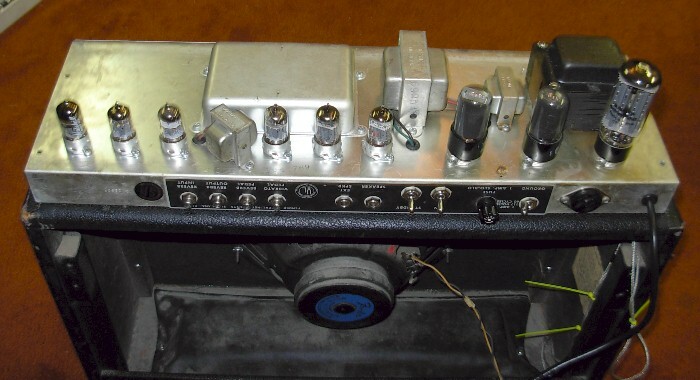 The power cord grounding wire was disconnected from the chassis inside the amp. A number of bolts and potentiometer mounting nuts were loose or missing. I heard loud audio frequency hum. 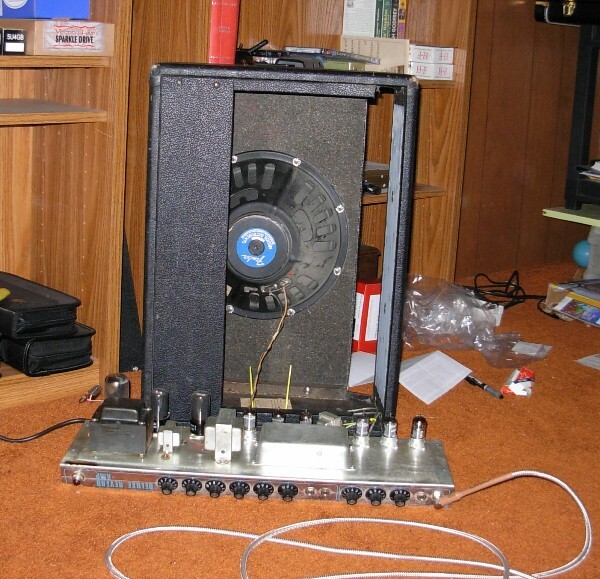 The pre-amp stage gain proved low; further, many of the tubes appeared to be original issue. Some of the 12AX7s, including V1 sounded quite noisy. The reverb did not work. The Normal channel tone stack proved extremely noisy and unstable. Most of the pots were very scratchy/noisy when rotated. Burned out power on indicator lamp. 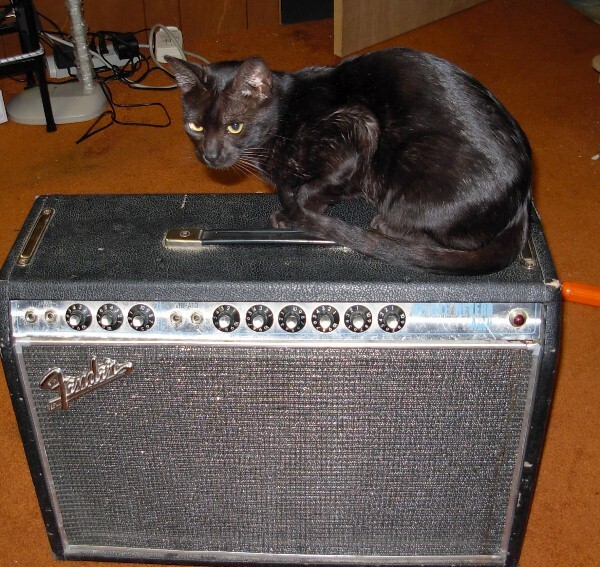 Above — This amp served as a favorite resting spot for our cat. It seemed obvious that this amp had been roughly handled over time. The first repair was to install a 1 amp slow-blow fuse plus a new spring-loaded fuse cap. Next, I pulled the reverb tank out of the cabinet and opened it up. Above — A photo of the reverb tank. It was easy to see why the reverb did not work. The green plus black wires which connect the reverb tank input jack to the input transformer were not connected. It seemed obvious that a reverb stage repair had occurred in the past. 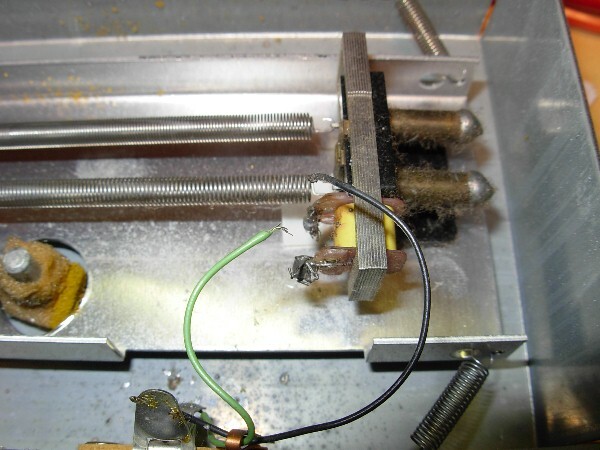 Worse yet - the person used some bad solder such as acid-core and the transformer lugs were corroded plus badly damaged. I removed the bad solder with flux and cleaned up the mess. I then re-soldered the wires using rosin-core solder and it's never fun soldering patch wires to 30-32 gauge reverb transformer wires. Above — I pulled the chassis out of the wood. The "infamous" long blue AC power cord can easily be viewed at bottom right. It had been grounded by placing the grounding wire under one of the power transformer bolts. Unfortunately this bolt had become loose. The 14 foot AC power cord was replaced with a 7 foot cord. Further , I bolted a lug to the chassis and soldered the AC power cord ground wire to this lug. After tightening all chassis bolts + nuts, I then installed a new "power on" light bulb. 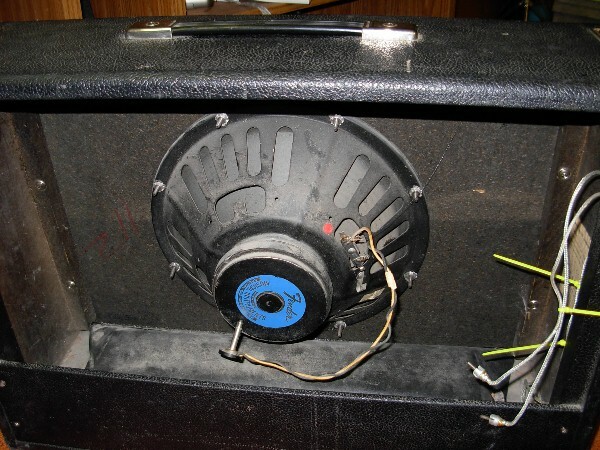 Above — The stock Jensen 12 inch speaker appeared in good condition. The reverb tank patch wires with RCA connectors seen to the right of the speaker tested OK. Above — The chassis laid out with the cover off of the main filter capacitor bank. The tubes (especially the power and rectifier tubes) were coated in a thick film. This DR really exhibited that "musty old amp" smell when I switched it on. Above — Five 16 µF/450 VDC, paper-covered Mallory electrolytic capacitors. I believe these were the original DC high-voltage filter caps and all tested leaky. Other repairs were made — I found a cold solder joint on the Normal Channel tone stack along with evidence of a previous (sloppy looking) repair. Additionally I measured high DC voltage on the treble pot that should have been blocked! I corrected all this mess with new parts plus due care. The potentiometers were "exercised" by turning them back and forth repeatedly after a shot of CAIG DeoxIT. I also soldered in a new 100 uF/100 VDC bias filter capacitor to stabilize the negative grid bias for the finals. Above — I replaced the tired, old Mallory filter capacitors with some F & T 22 µF/500 volt axial capacitors. This pretty much removed the hum from the audio chain. The old caps can be seen lying on the chassis for size comparison. Above — I replaced all but 1 tube with mostly NOS tubes from my collection and with my oscilloscope and some test equipment, set the bias voltage on the new matched 6V6 pair. I found that by turning the cabinet on it side, I could connect up the reverb patch cords and speaker for ear audio testing with a guitar and not have to worry about electrocuting our cat. Above — The repaired and tested chassis is laid on top the cabinet prior to reassembly. Note the shiny new tubes. The rectifier is a Russian-made 5U4GB. Above — Another view of the nearly completed project. The DR was reassembled, final tested and returned to its happy owner. 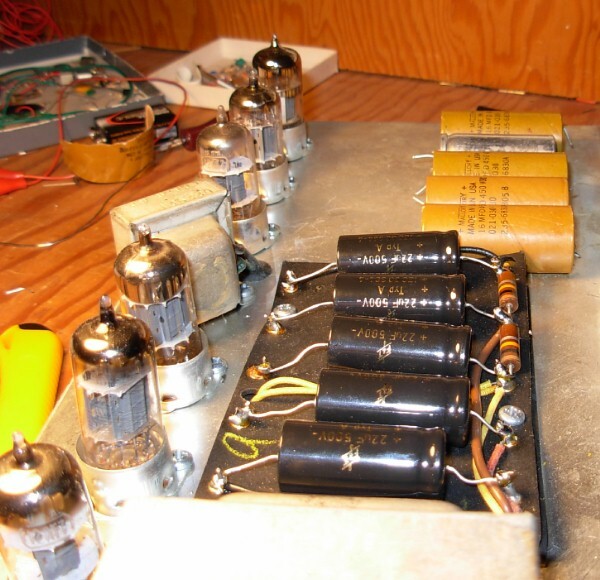 Above — An original 6V6 tube from this amp. The original tubes left a grimy, stinky substance on my fingers. Winner, winner -- cooked tube chicken dinner! Tube amplifiers operate at high DC voltages. 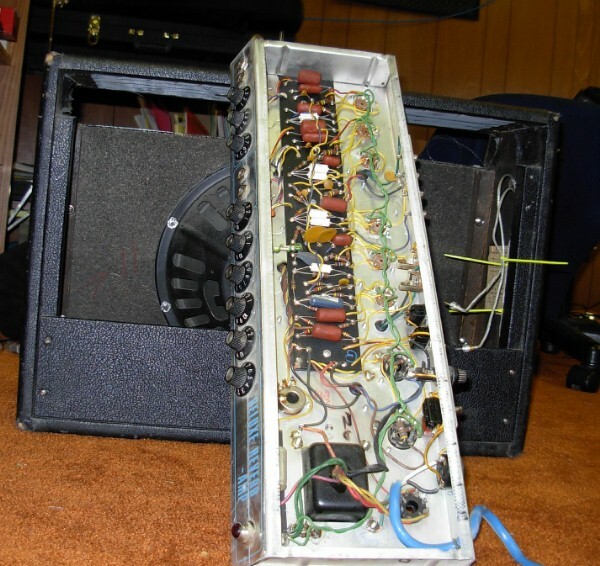 Repairing, modifying or building tube amps can be dangerous, or in some cases, fatal. Don't do it.